Our dedicated volunteers have indexed the names and businesses shown on the Map of Bergen and Passaic Counties, by G.H. Corey, John E. Gillette, and Griffith Morgan Hopkins. The map was published in Philadelphia by G.H. Corey in 1861 and shows the homesteads of thousands of families. 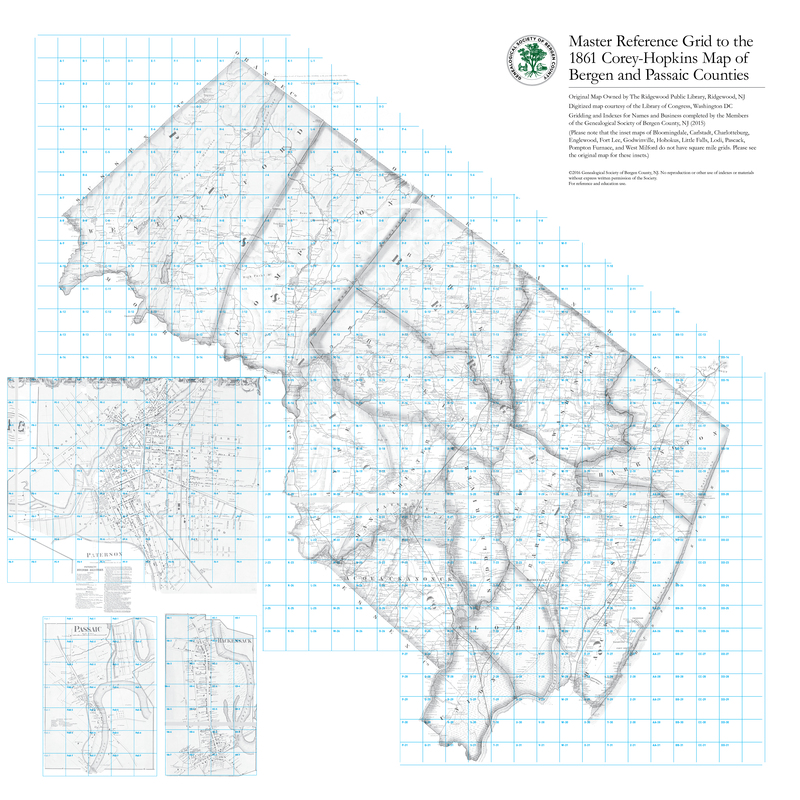 The Ridgewood Public Library (RPL) has an original Corey-Hopkins map, as well as as set of gridded black and white copies used in the indexing. Or, you can download a copy of the map from the Library of Congress (LOC) and Princeton University Library. (Note that the map at the RPL was less damaged than those in the LOC and Princeton, and has been professionally restored and conserved, but a digital copy of the RPL map was not available.) The map used for the grid and indexing is the Library of Congress' version. If you are looking for a name that falls very closely to the edge of a grid segment, and you do not find it, check the abutting grid section(s)—as each one of the maps were conserved in slightly different ways and have slight differences around the seams.